We're ready to help your office get zoned for sound. Whether it’s an overhead paging system, sound masking or background music, a professionally designed system can make all the difference when it comes to the quality of sound within your office. Who wants a speaker over their work area that blares incoherent pages that shock their heart, blow their ear drums or otherwise disrupt their work? Or, what about a sound masking system that blasts noise over their area — without being tuned — so they know exactly where each and every speaker is located. These are problems that can occur when the sound system wasn’t designed properly or wasn’t installed as designed. Each office is unique — your space is different than the space across the hall or road. For instance, your cubes absorb sound differently than others, and your floor reflects sound waves differently than the carpeted floors in other spaces. Likewise, there isn’t a one-size-fits-all sound system. There are manufacturers that offer free professional designs for paging, sound masking and background music that can help you put an end to the chaos. And, lucky for you, we happen to work with two of the best: Atlas Sound and Bogen Communications. 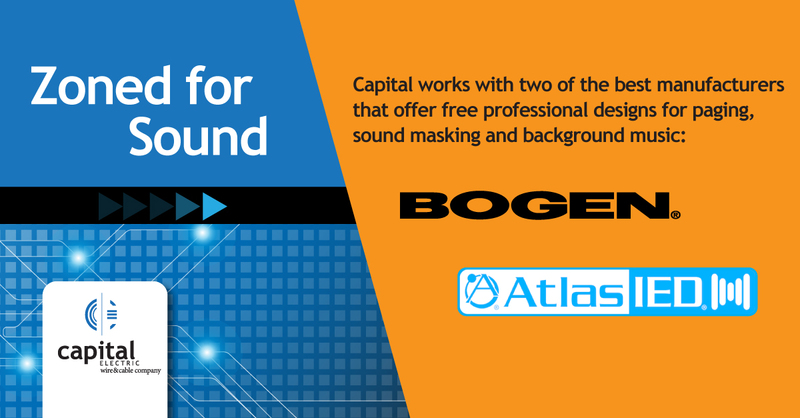 Atlas Sound offers paging, sound masking and complete audio systems. Bogen offers paging solutions systems in both 24 volts and 70 volts, and interfaces with any phone system available. Both companies employ expert staff who can create custom designs for the sound needed in your space. When designed properly, you’ll have sound levels that are audible not obnoxious; distractions will be minimized leaving your workforce focused on the work you want them to get done. Depending on the complexity of the project, a sound engineer can typically provide a complete design with speaker layouts, wiring diagrams and tuning instructions in less than two weeks. Capital works with some of the best installation professionals in the country. For a list of qualified, professional installation companies that can help you improve the sound of your office, contact us via the form below.